When it comes to denim styles, Lauren Conrad usually keeps things classic with skinny jeans. That said, it doesn't mean she's opposed to mixing things up. She just took to her website to wax poetic about fall's biggest denim trends, and she seems particularly fond of one fresh style in particular. Embroidered denim has been everywhere as of late, and the pretty trend is right in keeping with Conrad's cool, feminine style. She says of the trend, "One denim trend that I’m particularly smitten on is embroidery. I think an embroidered floral detail on a pocket or down one of the legs is sweet and feminine with a little bit of edge." We too have had our eye on the trend and have noticed that embroidered jeans are quickly selling out across the board, with more and more brands jumping on the bandwagon. Not sure how to style the trend? We suggest letting them shine by keeping the rest of your outfit simple—e.g., a solid-colored tee, sweater, or turtleneck and a pair of on-trend white ankle boots. 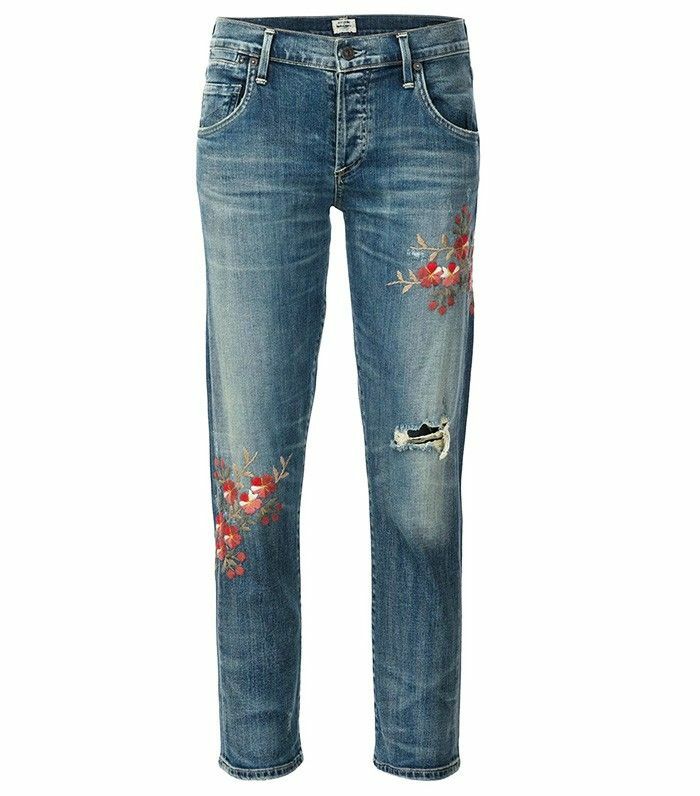 Keep scrolling to shop our floral embroidered denim picks, and head over to Conrad's site to read more about her favorite fall denim trends! These are subtle yet eye-catching. Topshop's dark-wash pair would be perfect with a pale pink top or shoes. We'd happily wear a pair of cool flares adorned with creatures and flowers. A $70 pair that looks this expensive? Sold! Would you invest in embroidered denim, given the Lauren Conrad stamp of approval? Comment below!